Wicked Case of Spring Fever - One of the Best Weeks of 2016? One of the Best Weather Weeks of 2016? "I'm not an economist and we all know economists were created to make weather forecasters look good" quipped Rupert Murdoch. Add stock brokers and political pundits, who all failed to forecast the meteoric rise of Bernie and The Donald. Predicting the future is not for the faint of heart. Frankly, I prefer to tell people what already happened. Much safer. TV meteorologists pointing to their magical green-screens may be at a rare (and welcome) loss for words this week; arguably one of the best of 2016. An atmospheric holding pattern will park a contented bubble of high pressure above the Midwest, forcing big storms south of Minnesota, keeping us sunny and balmy into next weekend. Last week was the definition of cool, wet and foul. This week will be a rush of atmospheric euphoria. Expect 70s by Wednesday; we could see some low 80s in our zip code by Sunday and Monday. Have an extra comp day? Take it on Friday. I'll write you a note. Models hint at a stickier, stormier pattern returning next week. But forget next week. Put the weather-blinders on. Try to enjoy the here and now! Reverse Lake Effect. The afternoon visible cloud loop was interesting yesterday, showing plumes of cloud-free air downwind of Minnesota's larger lakes (including Mille Lacs, Leech and Superior). Much cooler lake water inhibits convective, afternoon instability cumulus formation for as many as 20-40 miles down range. I thought it was vaguely interesting, then again I'm a weather geek. Loop: WeatherTap. A Flawless Week. I know, the meteorologist is not supposed to pontificate or editorialize. Just predict the weather, Paul. We don't care if it makes you happy. But it does. With sunshine in the forecast into Sunday and warming temperatures even the grouchiest of Minnesotans may crack a smile in the coming days. ECMWF guidance: WeatherBell. Evolving Into a More Summerlike Pattern. GFS-predicted 500 mb winds looking out about 2 weeks show the core of the jet lifting into northern Canada as summerlike heat levels push across the Plains. No more frost or flurries in sight until further notice. Climate Pendulum is Swinging Rapidly from El Nino to La Nina. Andrew Freedman reports at Mashable; here's the intro: "Say goodbye to El Niño, and hello to its less popular sibling, La Niña. Tropical Pacific Ocean waters are cooling rapidly after record warmth during much of 2015 and 2016 so far, signaling an impending shift. A new climate outlook released on Thursday puts the odds of a La Niña event developing in the tropical Pacific Ocean at 75 percent by the September through November period of this year. Forecasters' confidence in a developing La Niña event is high enough that the Climate Prediction Center (CPC) has issued a "La Niña watch..."
Map credit: "Sea surface temperature anomalies on May 12, 2016." Image: NOAA. An Oklahoma Tornado Rewrites the Rule Book. Here's the intro to an interesting post by Bob Henson at Weather Underground: "Overshadowed by the mighty EF4 and EF3 tornadoes that tore across south-central Oklahoma last Monday, May 9, another less damaging twister--from the same thunderstorm--has left seasoned scientists both astonished and fascinated. This tornado, which struck near Roff, OK, was rated an unexceptional EF1 on the Enhanced Fujita Tornado Damage Scale. However, the Roff tornado stands out in several other ways. It was an anticyclonic tornado, meaning that it rotated clockwise rather than counterclockwise. A few such twisters probably occur each year, but they account for only perhaps 1% of all U.S. tornadoes—and that’s a very rough estimate, according to tornado climatology expert Harold Brooks (NOAA National Severe Storms Laboratory)..."
Image credit above: "Doppler radar image of the supercell thunderstorm that contained a large EF3 cyclonic tornado (the Sulphur tornado) and a weaker EF1 anticyclonic tornado (the Roff tornado). The reflectivity image (top, with reds indicating heavy precipitation) shows the classic hook echo in connection with the EF3 tornado (labeled in the velocity image at bottom). The anticyclonic tornado (labeled in the bottom image) is firmly embedded in the heavy rain core along the storm’s forward flank, as shown in the top image. Image credit: Courtesy Roger Edwards and his Weather or Not blog." Weather Prediction Technology Improves, But Communication is "More Complicated". Meaning the potential for mixed messages and potentially dangerous advice from non-trusted sources has increased with a proliferation of social media. The democratization of media has a dark underbelly, as reported by KGOU in Oklahoma: "...On one hand, it’s good that we have so many different ways to get information to people,” Smith said. “On the other hand, there are so many different sources of information that people have, and there are all sorts of things that happen to information when it’s floating around out in the weather cloud.” Messages change as they are passed from one person to the next, either through Twitter or simple conversation. Smith said uncertainty terms like “possible,” “maybe” and “potential” are lost, and the message morphs into a warning about a “definite” tornado or severe weather outbreak. With social media, it’s like a game of telephone..."
Storm Chasing Research Helps Predict Southern Tornadoes. Could the composition of the ground make a material difference in tornadogenesis in the southeastern USA vs. traditional "Tornado Alley"? Here's an excerpt of an interesting post from Dan Bickford at wspa.com: "...While the basics of tornado formation are the same in the Southeast as in any other part of the country, Dr. Kevin Knupp of the University of Alabama-Huntsville believes the key to better predictions of which storms may produce tornadoes lies with the land we live on. “Our surface is much different in the Southeast. We have rougher terrain…trees, hills. So that surface roughness plays a role we think…and we’re trying to understand that better.” That’s because these objects can act as obstacles for wind, or serve to push surface winds in different directions while also changing the wind speed..."
After Fort McMurray, Where Are The World's Most Fire-Prone Cities? Here's a clip from an article at The Guardian: "...There’s no definitive list of the world’s most fire-prone cities, mostly because of the many and often compounding factors that can increase the likelihood of fires. As well as the growing vulnerability caused by climate change and poor urban management, other factors range from the prevalence of dry vegetation and use of flammable building materials to widespread open-flame cooking and, all too frequently, arson. But there is one relatively straightforward indicator of fire risk that can be tracked and mapped. It’s what researchers and foresters call the wildland-urban interface: areas where naturally fire-prone wilderness areas such as forests and shrublands are close to, or even intermingled with, housing developments, neighbourhoods or even – as in the case of Fort McMurray – entire cities..."
Photo credit: "A mobile phone image of the wildfire raging through the Canadian city of Fort McMurray on 3 May." Photograph: Twitter.com/Jerome Garot/EPA. 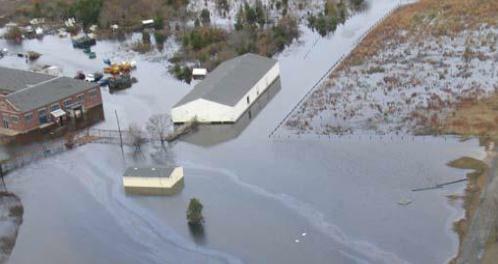 DNR Questions $2 Billion Fargo Flood Project. The Star Tribune reports: "The Minnesota Department of Natural Resources is taking a hard look at a $2 billion federal project that would protect Fargo from floods by diverting the water onto Minnesota lands instead. The DNR has compiled a 568-page study of the proposed Fargo-Moorhead Diversion and the effect it would have on Minnesota’s water quality, environment and people. The state has “significant concerns” about the project, DNR Commissioner Tom Landwehr said Monday..."
Graphic credit: Red River Diversion Project, Mark Boswell. Lloyd's of London Urges U.S. Government To Stop Insuring Floods. Financial Times ran an article that made me do a double-take; here's an excerpt: "Lloyd’s of London insurers have called on the US government to stop providing cover for flood damage, arguing that state support has become unsustainable and encourages irresponsible housebuilding. The national flood insurance programme has 5.2m policyholders, takes in about $3.4bn in premiums a year and covers $1.3tn worth of assets. But it has racked up debt of $23bn, mainly because of the costs from disasters such as Hurricane Katrina and Superstorm Sandy..." (File photo: NOAA). Mission Impossible? New England's Snowstorm "Bomb" From Inside a Doppler-On-Wheels. Here's an excerpt of an interesting series from NSF, the National Science Foundation: "Jan. 26, 2015. The day computer models forecast one of the most intense snowstorms in history. Meteorologists call it a "bomb." The bomb would hit coastal New England that afternoon. And night. And the next morning. Eventually it blitzed the region with more than 3 feet of snow. Blizzard warnings were issued from New Jersey to Maine. Cities in the path of the storm ground to a halt. In the first driving snows, a Doppler-on-Wheels (DOW) mobile radar--a truck with a swiveling radar dish mounted on its back like a huge eye--made its way through Massachusetts..."
Fracking's Air Pollution Puts Infants and Children at Risk of Developing Heart, Lung Problems. Truthout has the article; here's the intro: "A newly published peer-reviewed study concludes that air pollution from fracking puts people's lungs, hearts, and immune systems at risk -- and that the health risks are particularly pointed for young children and infants. The study -- the first to specifically focus on how shale oil and gas drilling affects children ability to breathe -- concludes that starting in the womb, children's developing respiratory systems are particularly at risk from five airborne pollutants associated with fracking and drilling..."
Renewables Are Leaving Natural Gas in the Dust This Year. Here's a snippet from ThinkProgress: "In the first three months of 2016, the U.S. grid added 18 megawatts of new natural gas generating capacity. It added a whopping 1,291 megawatts (MW) of new renewables. The renewables were primarily wind (707 MW) and solar (522 MW). We also added some biomass (33 MW) and hydropower (29 MW). The Federal Energy Regulatory Commission’s (FERC) latest monthly “Energy Infrastructure Update” reports that no new capacity of coal, oil, or nuclear power were added in the first quarter of the year..."
Debunking 4 Myths About the Clean Energy Transition. Here's the intro to a story (and series) from Clean Technica: "America’s electric system is at a stark inflection point: coal power plants are operating at all-time lows with growing retirements, natural gas prices are at historical lows while power generation is rising, electricity sales are flattening, extreme weather events are forcing more resilient infrastructure, and plunging renewable energy prices have made low- or zero-carbon sources cost-competitive with conventional fuel sources. Rapidly reducing greenhouse gas emissions from the electricity sector is now possible without radically disrupting grid operations, costs, or reliability. But the grid will require a more substantial transformation as we rely on higher shares of variable renewable generation. Some critics argue technological, financial, and institutional barriers will prevent significant decarbonization in the electricity sector, or will drive up the costs at the very least. But four common clean energy myths are easily debunked by facts and experience that show a low-carbon energy future is possible without sacrificing affordable, reliable service..."
One Building Is Saving $1 Million a Year on Energy. What Would Happen If The Whole World Was More Efficient. Details via ThinkProgress: "...And if you’re willing to go further than light bulbs, there is more hidden inefficiency to target. A retrofit at Pittsburgh’s U.S. Steel building resulted in $1 million worth of energy savings each year for the commercial building, according to Danfoss, another company that joined the EP100 initiative this week. That company installed new pumps for the 64-story building’s water supply and new fans in its air circulation system. In a case study, the building manager says that driving down energy costs has also made the building more attractive to tenants — a positive economic side effect. Buildings account for 40 percent of the electricity used in the United States, so making them more efficient will go a long way towards reducing the country’s overall demand..."
Photo credit: AP Photo/Keith Srakocic. "The U.S. Steel Building in Pittsburgh saves more than a million dollars a year after retrofitting for better efficiency." Map credit: Center for Public Integrity analysis of Federal Communications Commission, Census Bureau data. Road map by Stamen Design (CC BY 3.0), OpenStreetMap contributors. Postponing the Olympics is the Safe Course of Action. Safety of athletes and spectators should obviously come first, but when there's this much money on the line? I wouldn't hold my breath. Here's a snippet of an Op-Ed at The New York Times: "...Many emergency care facilities are operating on reduced schedules and lack basic supplies because of the withholding of resources to save money for the demands of the Olympics. This is happening during a severe outbreak of dengue fever in Rio de Janeiro, which remains one of the epicenters of the Zika virus with 26,000 suspected cases. The governor of Rio de Janeiro State announced a state of emergency for the public health sector in December, indicating that Rio´s health system is inadequate for the daily needs of the population, much less the extra stresses on the public health system that the Olympics would bring..."
65 F. high temperature Monday in the Twin Cities. 67 F. high at KMSP on May 16, 2015. Global Warming Worsens With Record Temps, Widespread Coral Bleaching. Hey, what's on TV tonight? Better yet let me call up my Facebook feed and distract myself beyond recognition. Here's a clip from USA TODAY: "...In the planet's Northern Hemisphere, where most of the world's population lives and burns fossil fuels, a benchmark reading from the Mauna Loa volcano in Hawaii reached a monthly average of 407.42 parts per million in April. In the slightly cleaner Southern Hemisphere, readings from an Australian measuring station surpassed 400 parts per million last week, according to Australian scientists. The rate of 400 parts per million is significant because the planet hasn't seen that much carbon dioxide in the atmosphere for millions of years. "This is the new normal. This isn't going away," said Pieter Tans, chief greenhouse gas scientist for the National Oceanic and Atmospheric Administration..."
Graphic credit: "National Oceanic and Atmospheric Administration (NOAA). As of May 16, 2016. Global Warming Won't Just Change the Weather - It Could Trigger Massive Earthquakes and Volcanoes. I HOPE this is alarmist hype, but just in case - here's a clip from Quartz: "...By his estimation, carbon dioxide emissions from human activity since industrialization began have changed the trajectory of earth’s climate for the next 100,000 years. We are already experiencing the mayhem and destruction that these changes can wreak, and, in the long term, things are only going to get worse. On the face of it, the hypothesis that a few degrees’ rise in the average temperature of the atmosphere can cause the earth’s tectonic plates to move sounds ludicrous. Yet, McGuire, professor of geophysical and climate hazards at University College London, shows through careful analysis of historical records that the relationship between the weather and the “solid” earth is incontrovertible..."
Photo credit above: "The raging earth." (Reuters/Cristobal Saavedra/Kyoto). Ice Caps Melt, Prehistoric Virus Escapes. No, It's Not a Movie. We don't know what we don't know. Here's an excerpt from Huffington Post: "A couple of months ago I talked about the connection between global warming and the Zika virus. Today I would like to discuss another interesting side effect we might observe in the next decades thanks to global warming. The ice caps will melt. Big deal, we already knew that. But have you ever thought of the stuff trapped in that ice that’s going to thaw? What if some of that stuff isn’t really dead, just dormant, waiting to come back? Sounds like fiction, but it’s not..."
Photo credit: University of Washington. Asthma Hospitalizations in Maryland Could Rise With Climate Change. Can we extrapolate these projections to Minnesota and Wisconsin? Here's an excerpt from The Baltimore Sun: "...The researchers obtained a database of 12 years' worth of Maryland hospitalization records and looked for links between severe weather and hospitalizations. They found that an extremely hot day in the summer was linked to a 23 percent higher risk of hospitalization for asthma while an extremely rainy day was linked to an 11 percent higher risk. With rising temperatures and extreme weather becoming more common, the impact on public health could be significant, the researchers said. Using the researchers' data, the state Department of Health and Mental Hygiene projects that hospitalization rates for asthma in Baltimore will more than double by 2040..."
Before She Denied Climate Change, Sarah Palin Acknowledged and Confronted It. Alaska Dispatch has the Op-Ed; here's an excerpt: "...Before she went down the tea party rabbit hole in 2008, into the fantasy world of climate change denial devoid of fact, science, or reason, Palin actually believed the science of climate change and the necessary governmental response. As governor in 2007, Palin issued Administrative Order No. 238 establishing the Alaska Climate Change Sub-Cabinet, which she tasked with developing and implementing an Alaska climate change strategy. This is some of what she stated in that order: “Scientific evidence shows many areas of Alaska are experiencing a warming trend. Many experts predict that Alaska, along with our northern latitude neighbors, will continue to warm at a faster pace than any other state, and the warming will continue for decades. Climate change is not just an environmental issue. It is also a social, cultural, and economic issue important to all Alaskans..."
Photo credit: "Palin's about-face on climate change reflects her plunge down the rabbit hole. Pictured: Palin speaks during a campaign event for Republican presidential hopeful Donald Trump at the Hansen Agriculture Student Learning Center in Ames, Iowa, Jan. 19, 2016." ERIC THAYER. Trump Turns to Global Warming Denier for Energy Policy Guidance. Here's an excerpt from a story at Christian Science Monitor: "...The presumptive Republican presidential nominee is seeking to build out his policy proposals as he pivots from campaigning for his party's nomination to a likely general election matchup with Democratic rival Hillary Clinton. Among those he has asked for help is US Representative Kevin Cramer (R) of North Dakota, one of the country's most ardent oil and gas drilling advocates and climate change skeptics. North Dakota has been at the forefront of the U.S. shale oil and gas boom..."
Photo credit: "U.S. Representative Kevin Cramer (R-ND) talks at the public launch of the U.S. Agriculture Coalition for Cuba while at the National Press Club in Washington, January 8, 2015." REUTERS/Larry Downing/File photo. Seven In A Row: April is the Hottest April on Record - a 7,000 Year Record? Details via HotWhopper: "...This is the seventh month in a row of "hottest months", all of which had an anomaly more than one degree Celsius above the 1951-1980 mean. This breaks the previous record of six in a row, set last month. This hasn't happened before in the record since at least the 1950s. Earlier times probably aren't sufficiently accurate on a month by month basis to say. I didn't check back that far and, in any case, pre-1950s temperatures would probably have been hotter at some time in the last couple of millenia. What that means is that it's probably more than 7,000 years since there was a similar run of hottest months on record. That is, not since the Holocene climatic optimum (and it's probably hotter now than it was back then)..."
Graphic credit: "Global mean surface temperature for El Nino years". Data source: GISS NASA. Earth Just Recorded Its Warmest April on Record, And It Wasn't Even Close. More perspective from Andrew Freedman at Mashable: "...The record all but assures that 2016 will set another milestone for the warmest calendar year in NASA's database, regardless of whether the rest of this year sees comparatively cooler global temperatures. During each of the past seven months, global average surface temperatures have exceeded the 20th century average by more than 1 degree Celsius, or 1.8 degrees Fahrenheit. Until October, that 1-degree threshold had not been crossed since NASA's global temperature records began in 1880..." (Image: NASA GISS). NASA: April 2016 Was The Seventh Consecutive Warmest Month on Record for Earth. Here's a clip from a post by Dr. Jeff Masters at Weather Underground: "Every month from October 2015-April 2016 has now had a departure of 1 degree Celsius or greater above the 1951-1980 average used by NASA. The departure from average in a single month had never exceeded 1 degree Celsius prior to October dating back to 1880. April 2016 also continues a string of 369 consecutive months at or warmer than average. The last colder-than-average month in NASA's database was July 1985..."
A Song of Fire and No Ice: We Just Had Our Fourth Record-Breaking Hottest Month in a Row. Here's an excerpt from ThinkProgress: "...How big a jump was April 2016 compared to the historical record? In an email, Stefan Rahmstorf, Head of Earth System Analysis at the Potsdam Institute for Climate Impact Research, notes that “The margin by which April beats the previous record April is three times larger (0.24 °C) than the margin of any previous record April (biggest was 0.08 °C).” Also, this has easily been the hottest January-April on record, which isn’t a surprise given that last month’s record was hot on the heels of the hottest March on record by far, which followed the hottest February on record by far, and hottest January on record by far..."
Graphic credit: "Global mean temperature anomaly (vs 1951-1980 mean), month of April only." CREDIT: NASA. A Week That Restores Your Faith in a Minnesota May - 80s Next Week?